L = 330 mm, W handle top = 12 mm, Th handle top = 10.5 mm, W handle centre = 13.5 mm, th handle centre = 12.5 mm, L spoon bowl = 92 mm, W bowl = 63 mm, Ht bowl = 22 mm, depth bowl = 20 mm [RTS 21/6/2004]. Spoon carved from a single piece of light yellowish brown coloured wood (Pantone 7509C) and then polished. This has been cut roughly flat at the top and has a long handle with irregularly oval section, decorated with a broken reddish brown pyroengraved line running in a spiral down the lower part of the handle. This joins onto a shallow bowl with thin rim, concave interior hollow and convex underside. The bowl is lentoid in plan view, being pointed at either end. The handle continues to run along the length of the bowl underside as a tapering raised rib that extends to the end of the object, presumably to strengthen the join between handle and bowl. The spoon is complete and intact, weighs 55.1 grams and is 330 mm long. The handle measures 12 by 10.5 mm at the end and 13.5 by 12.5 near its centre, while the bowl of the spoon is 92 mm long, 63 mm wide and 22 mm high and 20 mm deep. This object was collected by Brian John Mack when working amongst the Toposa in the Southern Sudan in 1980. It appears to have been accessioned retrospectively as part of Patti Langton's collection later that year, using the same group number assigned to material from her 1979 expedition, which Mack had been a part of. However his 1980 fieldwork appears to have been undertaken independently of Langton, although she was working amongst the nearby Boya at the same time. 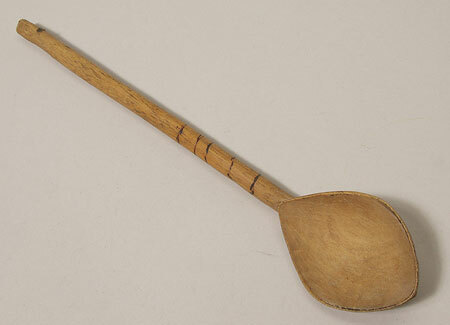 The collector did not record any further information on how this type of spoon was used, or the name that it was known by locally. Among other Nilotic cultures such as the Larim, they were used for eating (see 1979.20.151-152). For general discussions of the Toposa, see the article by Captain G.R. King in L.F. Nalder (ed. ), 1937, A Tribal Survey of the Mongalla Province, pp 65-81 and A.C. Beaton, 1950, "Record of the Toposa Tribe", Sudan Notes and Records XXXI . Accession Book Entry [p. 185] - 1979.20 (.1 - 206) P[urchase] MISS PATTI LANGTON, DEPT. of ETHNOLOGY & PREHISTORY, OXFORD. Collection made by Patti Langton during the British Institute in East Africa's expedition to the Southern Sudan; Jan. - April 1979. The collection was made in three culture areas during the dry season. The amount paid for each object is listed if the information is known. In Jan. 1979 £1 is equivalent to 95 piastres (pt.) Sudanese. This documentation is based largely upon Patti's own list of objects and her notes on these. Sometimes objects included in the Pitt Rivers alottment of the collection do not appear on her list and have been added here. See Related Documents file as well. [p. 214] 1979.20.194 - SOUTHERN SUDAN TOPOSA Collected in 1980 and sent via John Mack, Mus. of Mankind [p. 214] 1979.20.194 - 197 Four wooden spoons: [1979.20].194 Light wood; burnt line decoration on handle. Total L = 33 cm. Additional Accession Book Entry [beside accession number in red biro] - A6-F25-1. Written on object - Toposa. P. Langton coll. 1979.20.194 [RTS 21/6/2004]. Sparks, Rachael. "Toposa spoon" Southern Sudan Project (in development). 03 Jan. 2006. Pitt Rivers Museum. <http://southernsudan.prm.ox.ac.uk/details/1979.20.194/>.